Last week, Renaissance man James Franco opened his New Film Stills at Chelsea’s blue-chip Pace Gallery, which has since sent me into a Franco-inspired slow rage boil since I first heard about and had the unfortunate pleasure to see the exhibition. In order to voice some of this seething anger, as well as take a serious look at why Franco’s photographs bother me to no end, I felt it was necessary to embark on a Filthy Dreams rant. Whats that? Is your temperature rising too? Well, Mary, pop a few Xanaxes, have a drink and let’s get pissed. 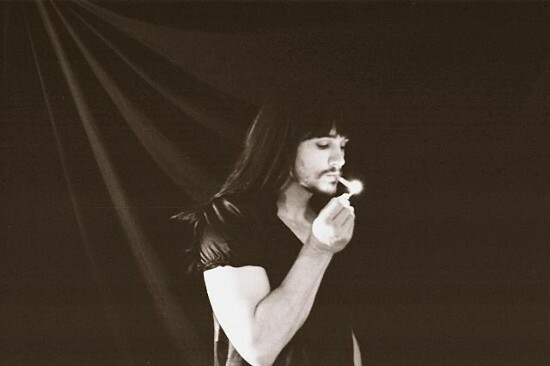 In New Film Stills, Franco jarringly recreates seminal Pictures Generation photographer Cindy Sherman’s now iconic black-and-white series Untitled Film Stills, mirroring the same scenes, expressions, poses and clothing as Sherman with the exception of Franco’s scruffy beard. As bad as that sounds, somehow they’re even inexplicably worse in person. Walking through the exhibition, I kept searching in my purse for something to blind myself with, or, even better, a tool to give myself a pre-frontal lobotomy so I could forget this ever happened. But it was to no avail. In order to understand the horror of Franco’s appropriation of Sherman’s Untitled Film Stills, the significance of Sherman’s series must be understood. Completed between 1977 and 1980 during the derelict yet creatively enlightened years of bankrupt and desolate Lower Manhattan, Sherman employed the visual language of Hollywood glamour and female stereotypes to delve into the nature of gender performance. Using these various character types from the damsel in distress to the seductive lone female figure, Sherman managed to erase her own identity, flawlessly becoming each and every one of these cinematic tropes. While her series hits on critical issues from the relationship between cinema and photography to voyeurism, Sherman’s Untitled Film Stills are ultimately a feminist precursor to Judith Butler’s understanding of the performativity of gender, depicting the self as a series of potentially mutable and ever-evolving series of images, representations and constructions. Throwing her own identity into question as she disappeared into these characters, Sherman deftly portrayed the unstable and self-fashioned performance of being a woman. Conversely, Franco ubiquitous personae refuses to disappear within his film stills. 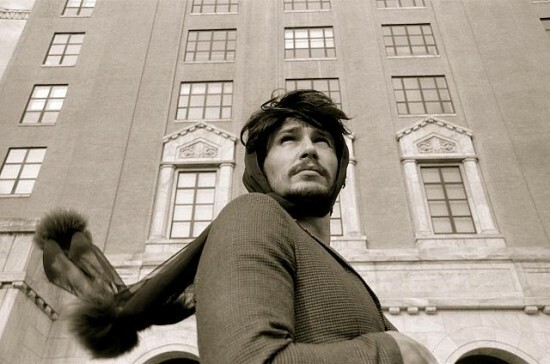 Despite the similar costumes, poses and self-fashioning, Franco’s film stills are nothing but more photographs of James Franco. 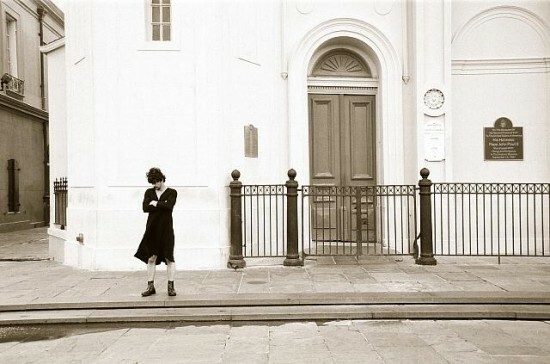 However, before we get into more ranting about Franco’s photographs, let’s allow Franco to explain his own notions of his photographs and use of Cindy Sherman’s seminal series. As Franco explains in the press release, “Cindy is an artist who used cinema as a source for her work, she ‘played’ at being an actress. I am an actor who inserts himself into his work. Cindy used cinema as a starting place. I use art as a starting place.” Ok…now we can move on. Franco, who has a nasty habit of taking on queer themes and imagery while continuing to assert again and again that he’s not gay (the Hollywood version of “no homo”), creates with his New Film Stills an exercise in male privilege. And in that, he is very successful, revealing the power of particularly straight white cisgender men to co-opt any type of queer or feminist subversive act. An almost invasive gesture, Franco appears to be taking on Sherman’s women-centric critique, saying “Look I can do this too!” without any indication that he understands or even acknowledges the potentially unsettling and destructive commentary his photographs have on Sherman’s original statement. Franco does not investigate the gender performance of a man in Hollywood, which would actually be an interesting and relevant photographic series, but instead, chooses to usurp Sherman’s feminist gesture. Perhaps even more troubling than Franco employing Sherman’s artistic language is Franco’s use and potential misuse of drag in these photographs. If he, as his statement indicates, is trying to make a statement about his place in Hollywood then what exactly is the point of his use of drag other than as a sort of gag devoid of critical meaning or intent? In fact, Franco’s use of drag is presented in a way that only further cements his own masculinity within an appropriated image of femininity. Focusing on his beard, his large, hairy man-feet and women’s shoes that are too small for him, Franco continually asserts his own masculine identity. He’ll use drag and Sherman’s feminine stereotypes but not appear too femme as to throw his own identity into question. He’ll do it just enough to get the accolades and the gallery exhibition. Not only are the photographs themselves troubling and just at the edge of offensive, but his immediate success and blue-chip gallery exhibition are abhorrent when compared to the struggle of Sherman to get her photographs shown decades earlier. When Sherman first created her Untitled Film Stills in the late 1970s, Sherman, according to the Metropolitan Museum of Art’s The Pictures Generation catalogue, sold the photographs for $50 from a binder at Artists Space (135). Conversely, Franco’s photographs earned him an exhibition at Pace Gallery right after the exhibitions of two major New York artists, Chuck Close and Kiki Smith. In some respects, what Franco has done outside of Hollywood whether in academia (Franco holds five MFA’s and is pursuing a PhD at Yale, as well as taught at several schools) or the art world is completely ingenious though I suspect also unintentional. Franco has and continues to expose just how far star-power and a lot of Hollywood money will get you in the normally cliquish fields of academia and the art world. And perhaps that is the horrifying strength of Franco’s art–asserting how he has the ability to take on any language, any culture, any field he so pleases. When I went to Pace to see the exhibition, several visitors were laughing their way around the gallery. I don’t blame them–I couldn’t help but laugh too. And yet, the joke is ultimately on us: the women, the queers, the art world, the critics, etc. As Franco’s art undeniably depicts, nothing cannot be usurped by dominant culture and the privileged. 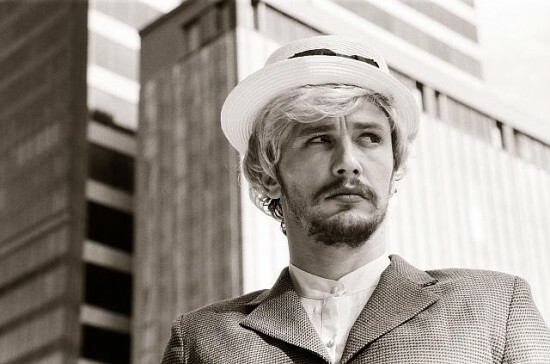 Now, all I can hope is that this will inspire Cindy Sherman to complete a scathing series of portraits as James Franco. Please, Cindy, please! Do it for all of us! Tags: bad camp, Cindy Sherman, Filthy Dreams' rant, James Franco, New Film Stills, Pace Gallery, photography, Untitled Film Stills. Bookmark the permalink. You sound so bitter that you both went to NYU grad school and he’s extremely successful and you’re not. You criticize him for doing a lot of things but excelling at none of them. He’s actually a good actor and I like his writing. You’re not very good at writing yourself so does that mean you should just stop? Riley, I’d like to introduce you to the concept of the ad hominem response. Google it. With the juxtaposition of beard and costume, it really comes off like he’s just going for the “lol, dude in a dress” laughs, which is gross and ultimately transmisogynist. Maybe ad hominem posts just inspire ad hominem responses. I’m just offended by how little he actually brought to the original photos. I think there could be something interesting in something inspired by the original series; these seem strictly imitative, like something he would have done on a whim one afternoon. I’ve seen more evocative and meaningful selfies on Instagram. I love the idea of analyzing privelege as a form of gaslighting people’s experiences! It’s brilliant! I guess lobotomizing any region of the brain would probably do the trick, if you did it in the moment. But it seems like hippocampus would get the job done for sure (H.M. style). If you’re living and walking in New York City, you should really be keeping some kind of knife or blade in your purse. James Franco is a clique basher. His hammer-of-fame swings violently and he smiles on as everybody ducks and others applaud. Oh well. Pineapple Express was funny. Riley is right…you are being a little too rigorous with Franco. I think he’s a good actor and i don’t think he’s disrespecting Sherman’s work.